Getting a new look to your house interior doesn’t necessarily mean new furniture. Of course you don’t want to throw out your old chairs; new furniture just isn’t made like it used to be. Save yourself pounds by re-upholstering your classic, stylish furniture. Tip: The approximate quantity of fabric required for seating is; 1 meter for two seats; 1.5 meters for four seats; 2.5 meters for six seats. 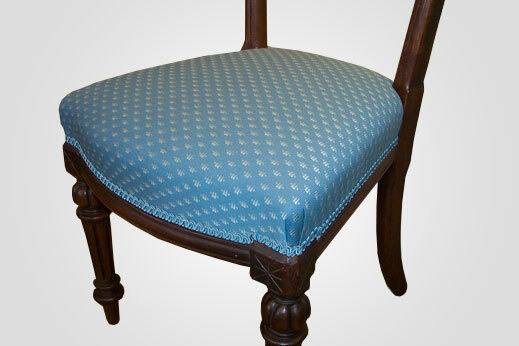 Tip: The ideal foam for dining chair seating is the Regal Luxury or Imperial Comfort. For daily use we recommend choosing the firm or Extra firm from these choices. Tip: The foam for the seats can come in a range of thicknesses, depending on the type of seat / chair it can range from 1", 1.5" and 2"
For this you will require your foam and generally with these seats the foam is made larger than the plywood because the foam is wrapped over the edge. You can use your existing foam as a template. You will need to either staple or glue your foams (using spray adhesive) to the plywood panel. The foam should then be covered in 4oz polyester wadding and secured into place with spray adhesive; the seat is then ready for your top cover. The fabric needs to be stretched tight, gathering pleats in the corners and tacked to the underneath of the plywood seat. Once completed trim off the excess material and fit black dippryl bottom cloth. If your seats fit within a rim, the foam mustn’t exceed the size of the seat. Generally this type of seat sits within the frame of the chair. The foam needs to be flushed with the edge. If you are using 1.5” or 2” foam, to create a rounded edge to your seat we recommend you bevel the edge of your foam, using a serrated knife. Once the foam is fixed to the seat panel apply the polyester wadding. You can now apply the top cover and finish as above. 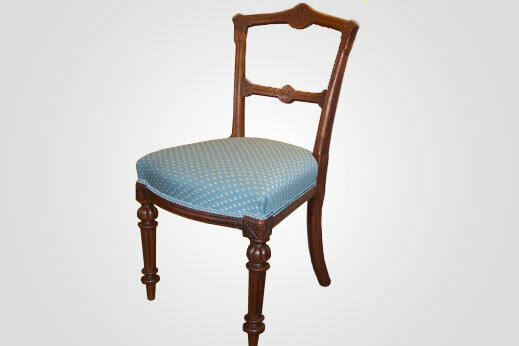 A wooden framed seat with traditional upholstery, i.e. webbing and Hessian. To start this re-upholstery project, you need to check that you have sufficient room clearance between the seat and the chair frame. If the new fabric you have chosen is thicker than the original fabric you need to be aware of making the seat fit back into the frame once upholstery is complete. If it does not fit you will need to plane off the excess wood to make the seat fit. You also need to use glass paper to smooth off any sharp edges on the frame before you begin. The next stage is using a tape measure; find the centre of the frame to aid the placement of webbing. On an average size seat you would normally put three stripes of webbing horizontally and vertically and have them interwoven to make a solid and sturdy base. You would need to use a webbing stretcher to ensure the webbing is taut. The webbing can either be fixed with 10mm staples or 13mm improved tacks. The next stage is to cut the Hessian an inch larger than the frame all round and tack or staple into place. Fold over the edges and tack and staple again to the frame and then cut off any excess material. The seat is then ready to have the foam seat pad attached or traditional fibre filling and cotton felt. If you are using a more traditional filling it is advisable to have a calico cover before the top cover is fitted. Polyester can be used to top the foam seat pad or to go on top of the calico cover before the top cover is fitted. Ensure the top cover is fitted tightly and at the corners you need to cut away any excess material in order to form a pleated, tidy corner. The seat should now slot into the frame on the chair. Ercol chairs are renowned for their high quality and durability. We have found that these are the most popular seat pad customers like to replace. These are normally held in place to the chair by four webbing straps with press studs. We not only can provide new foam interior, we can also provide you with tailor made replacement seat covers. For the DIY enthusiast undertaking this task, we can also provide all the sundries you require for this in our upholstery online catalogue. 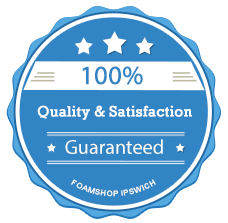 For your new foams, you can either send us the original covers (we would only require one cover if they are all the same size) or make a template of the old foam. The ideal thickness required for these seat pads is 1.75” and we recommend the extra firm choice for these. These pads are often dome shaped so we will fit a 6 oz polyester pad and stockinette cover to protect your foam and covers. Wooden or wicker chairs can be rather uncomfortable without a cushion. Making a loose cushion pad is well within the skills of an avid enthusiast. Firstly you will need to make a template of the seat and select from our range of foams a suitable match to your needs / wants. Tip: Make your template slightly smaller than the seat shape to avoid wear and tear on the edges once the seat is made up. If you feel you can cut the foams to your size required using your own templates, you can order a squared size from our website and cut to size with a serrated knife. If not we are more than happy to cut these for you, we just need your template or measurements. Often the seat pads will need securing in place. Common ways of doing this is either a tie made from the seat cover material or a 1” wide heading tape. As with all seat pads these tend to pull on the ties so we would advise fitting an anti-slip fabric under your seat pad. This is cut much smaller than your seat pad so cannot be seen.